The entrance to Woolwich foot tunnel on the south bank of the Thames is not the most pleasant of places to start a Bank Holiday walk. While Waterfront Leisure Centre – the first landmark I spotted bar some public toilets – may be a fun place for children to enjoy water slides and inflatables, the shack that it’s housed in is not. And things didn’t get much better as I walked along the fringes of Woolwich town centre. In one direction I saw pubs that were boarded up (or looked like they were just about to be), while looking the other there were former industrial buildings that had seen better days. The closure of the Siemens factory in 1968 and the Royal Arsenal (which dated back in 1671) in 1994 after several years of scaling back the workforce, drastically reduced the number of local jobs in the air. And despite the recent launch of considerable regeneration projects, the Woolwich I saw as I continued my walk along the 78-mile Capital Ring trail running around the outskirts of London looked in a sorry state. But then, almost without warning, the scenery changed and I enjoyed a pleasant walk through a series of connected parks that seemed a long way from Woolwich town centre. And such was the busy network of trails here that I actually briefly got lost in a place called Gilbert’s Pit – the last of a group of disused chalk and sandpits – that was used on a large scale from 1880 to 1938, with the raw materials mainly used for glassmaking and for putting on parlour floors before carpets became fashionable. “We went on board the captain’s six oared boat at ye west end of the yard, where almost all the sand used by the housewives of London is put on barges from carts which bring it down from ye neighbouring hill,” noted a letter of 1762. Maryon Park and the adjoining Maryon Wilson Park were once owned by the Maryon Wilson family who lived at Charlton House, which is today on the edge of a third park, Charlton Park. The family presented land to London County Council in 1891 so that a park could be opened, although they retained their estate and residence for another three decades. 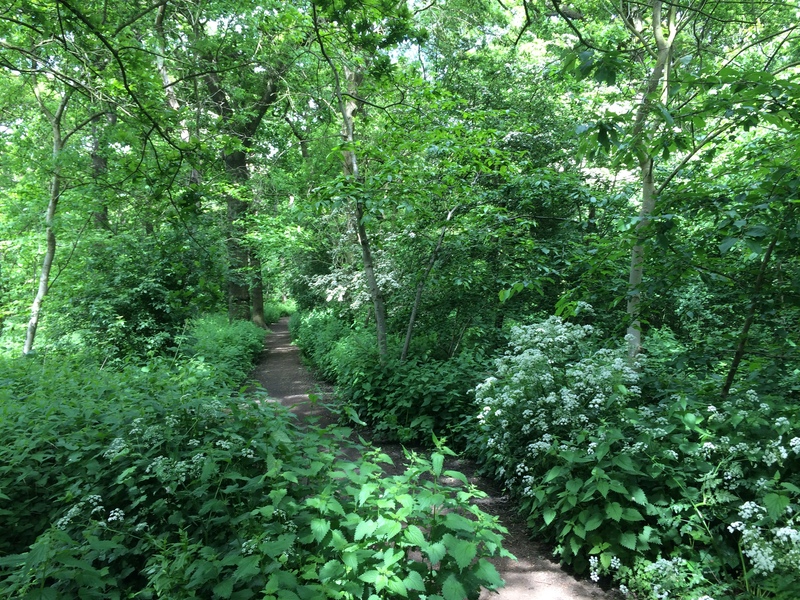 The walking route takes you through a deer park and small animal farm in Maryon Wilson Park which is popular with children. Originally it was known as Hanging Woods because highwaymen who were captured in these parts were hung here. 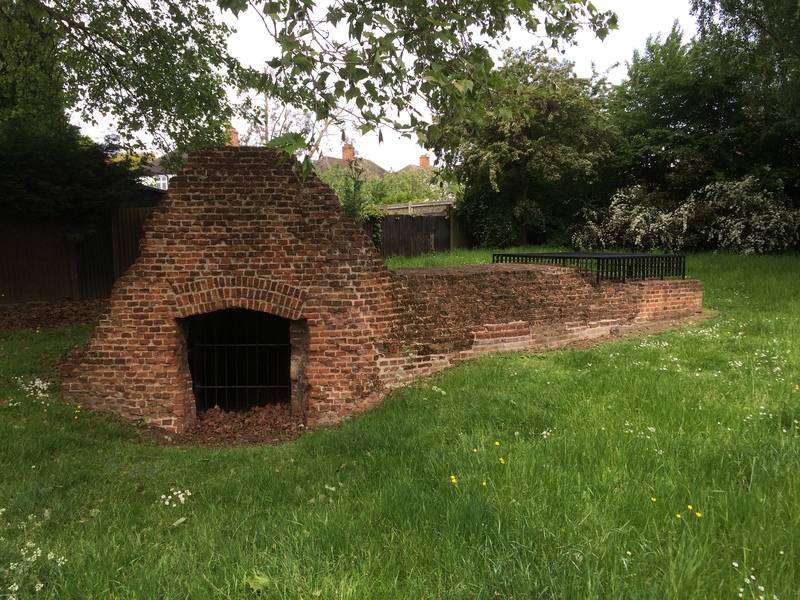 There are records of the whole garrison of Woolwich pursuing a pair who were eventually captured in the wood where “they had imitated the example of hunted foxes and gone to earth in an old drain”. My route then took me into Charlton Park. 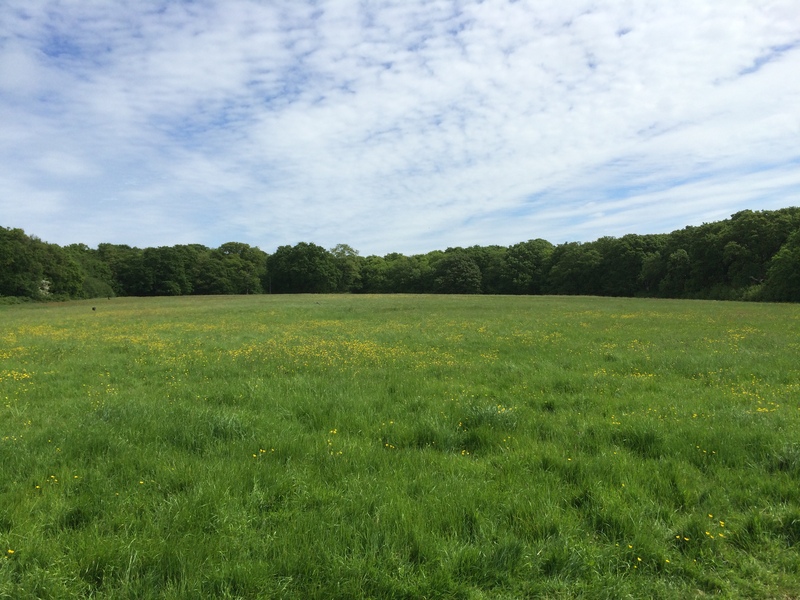 Although less landscaped than the previous two parks, it does have a huge expanse of grass which makes it ideal for football and cricket, there is a mass of play equipment for children and an outdoor gym. The highlight of the park though is the red-bricked Charlton House, a fine example of Jacobean architecture and dating back to 1612. It was built for Sir Adam Newton, Dean of Durham, who was tutor to Prince Henry, eldest son of James I. 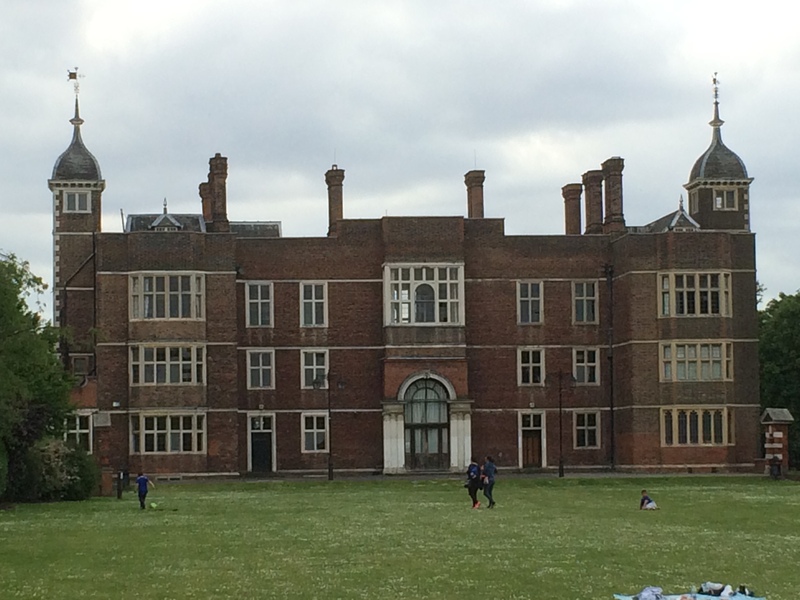 Writing in the 17th century, John Evelyn, the diarist, described the prospect from Charlton House as “one of the most noble in the world, for city, river, ships, meadows, hills, woods and all other amenities”. “The Hall of the fine old house was devoted to the stalls and bazaar, and was most gaily decorated—the summer house, to a childrens’ bazaar—the dairy, for ice creams and confectionary.—Every possible arrangement was made by the worthy Baronet to afford pleasure and accommodation to the company. —The Royal Artillery Band was stationed the front Lawn, and the Rifle Brigade Band in the Shrubbery in the rear of house, and alternately enlivened the scene by their enchanting music. The weather on Tuesday was beautiful, and drew together all the rank, beauty& fashion of the surrounding neighbourhood”. Charlton House was restored in 1878 for the Maryon Wilson family. Boasting an original oak staircase and plasterwork ceilings, the building that can be visited today includes a great hall, chapel, dining room and gallery – and is popular with conferences, weddings and other functions (Sir Spencer Maryon-Wilson sold the estate to London Country Council in 1925, with part of it becoming a public park and the house itself has had a variety of uses over the years, including library and community centre). Although the house was closed up when I visited I was able to enjoy a coffee in a cosy little cafe – the Old Cottage Coffee Shop – on the edge of the park. Like many park cafes, the menu was centred on cooked breakfasts, but inside it’s very quirky with an array of table lamps, musical instruments hanging on the walls, numerous framed pictures and shelves of books which were being sold in aid of Macmillan. After passing over the wilds of Woolwich Common and through Oxleas Woodlands – which is 8,000 years old in parts and designated a Site of Special interest in 1984 – I arrived at Severndroog Castle. One of the highlights on my walk today, the brown bricked triangular folly with cream framed windows on each of its turrets, was erected in 1784 as a memorial to Sir William James Bart by his wife. Sir William James, who owned the land in the 18th century, worked for the East India Company where he was tasked with combatting piracy. He captured a fortress of Suvarnadrug in India (explaining the castle’s name). Standing on the top of Shooter’s Hill (so named because highwaymen took advantage of the remoteness of the area and preyed on unlucky travellers on their way from Dover to Canterbury) with a record from 1226 saying it was “the hill of the shooter or archer”), Severndroog Castle offers fine views across the surrounding area and it’s said that on a clear day you can see seven counties from the top. The castle wasn’t really designed to be anything other than a memorial, but it has been used by a number of institutions over the years, including the Trinity lighthouse company for light testing (people within 30 miles were asked to report back on the effectiveness of each one). It was a lookout point during World War Two and had a direct phone line to Whitehall. And today pilots at nearby Biggin Hill airfield use it as a navigation point. It was described in 1889 by the Morpeth Herald as a “hideous building”. Yet for author E. Nesbit, it was known as a “Tower of Mystery” in her 1901 children’s novel The Would-Be-Goods. But when council funding dried up, Severndroog Castle was left in a decaying state for many years, until the surrounding woodland was threatened with development and local residents were mobilised into action. 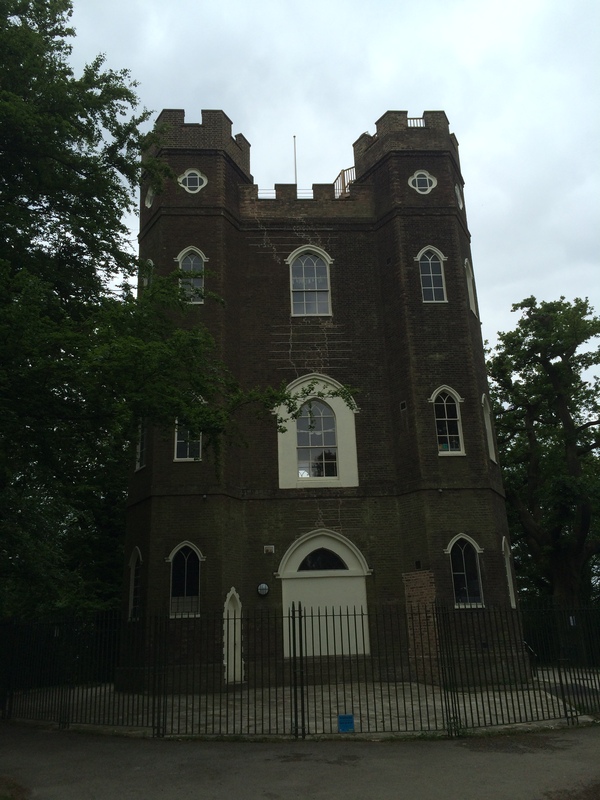 The Severndroog Castle Building Preservation Trust was formed and, after extensive renovation, it is open to the public again. There is a cosy tearoom run by volunteers downstairs several days a week and there is a room on the first floor – the Lady James Room – with a chandelier and gold gilded ceiling which is popular for weddings. After passing through Oxleas Meadows and more woodland along a well-marked, firm path, I eventually came to a red brick structure called Conduit Head. It was built in the 16th century to provide water for Eltham Palace was a prompt that I was nearing the great estate itself. But exploring that great attraction – now in the hands of English Heritage – was for another day and so I ended my walk by catching a train from the highly ugly, red modernist Eltham station back in central London. My trip along the Capital Ring continues next Thursday on Pastinthepresent.net when I walk from Eltham Palace to Crystal Palace. If you have missed any installments from my trek, you can read all the articles that have been published so far here.